SMFA Fine Art students are organising a series of creative workshops and events to engage with the University’s students and staff, as well as the general public, with the aim of presenting a platform which provides insightful experiences and raises awareness of the upcoming Degree Show. 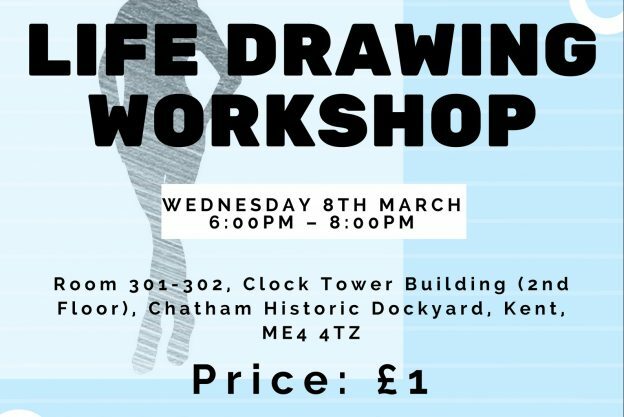 The first event, organised by the Fine Art Degree Show Private View and Engagement Team, will be a life drawing workshop on Wednesday 8 March from 18.00 – 20.00 in the Clock Tower Building (Rooms 301-303) at the Historic Dockyard Chatham. It is open to everyone (age 16+) and only costs £1. Please contact Charlene cb655@kent.ac.uk to reserve your space. This entry was posted in Campus online, Student Guide on 23 February 2017 by George Williams.